Department of Art | Lots of Art Exhibitions at FSU’s FAB Tonight, 11/16! Home » News » Lots of Art Exhibitions at FSU’s FAB Tonight, 11/16! Lots of Art Exhibitions at FSU’s FAB Tonight, 11/16! Announcing the inaugural opening of the FSU Art locker gallery, Gallery 208. 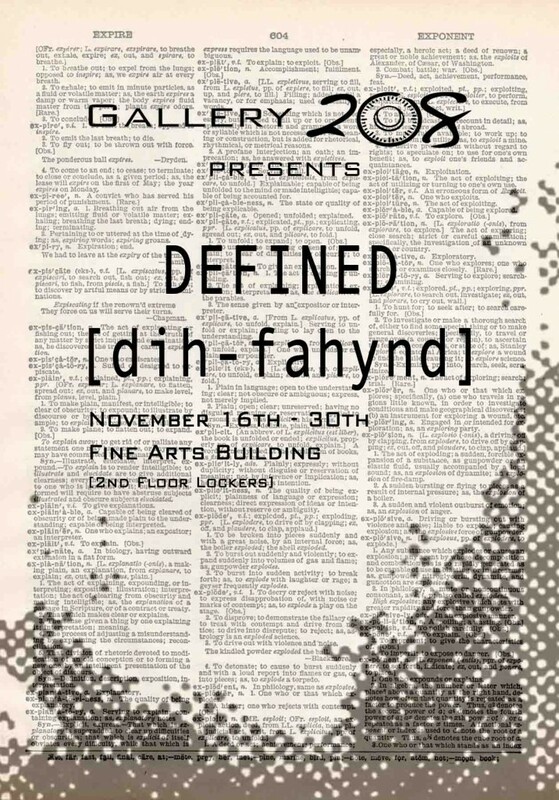 Featuring the work of Jonny Hunt’s 2D Foundation’s students in Defined. This gallery is on the ground floor of the Fine Arts Building. The work of Kevin Curry’s Digital Foundations students, Amanda Boekhout’s 2D Foundation students, and Johnny Hunt’s 3D Foundations students is also on view in the hallway display cases. Please check these out when you come for the openings at FSU’s Fine Arts Museum, the graduating students exhibitions, Exit Strategy and Le Salon de Refuses. 7-9 pm with Eduardo Corriazo’s artist talk at 6:30.